Blueberries have always been one of the more popular fruits from the berry family. There health benefits have been well known for years. Fun to eat, perfect in smoothies, great for desserts & salads, and easy to grow in garden planters! Here are a few easy tips! 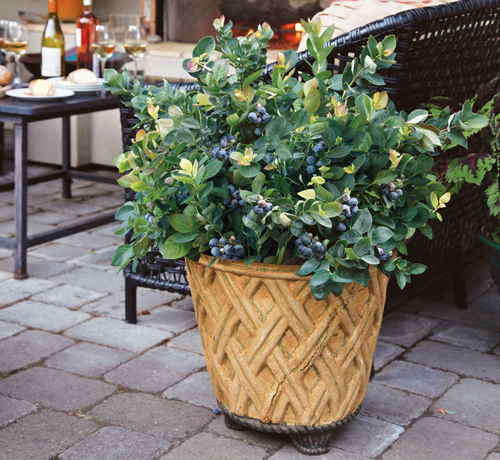 Start by selecting the planter you want to pot the blueberries in. Make it large, at least 18 inches deep and as wide as possible. These plants need lots of space for a hearty root system with plenty of room to grow. Place the container in a area of your yard or garden where it will be full sunshine. 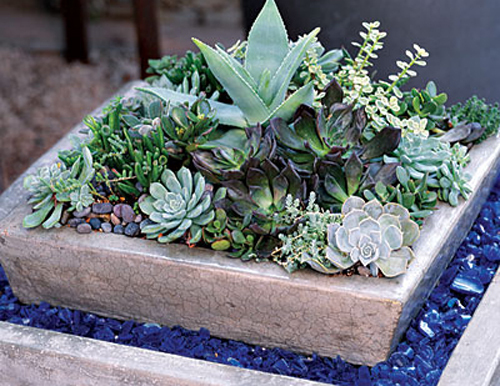 Use a potting mix that will give you great drainage. 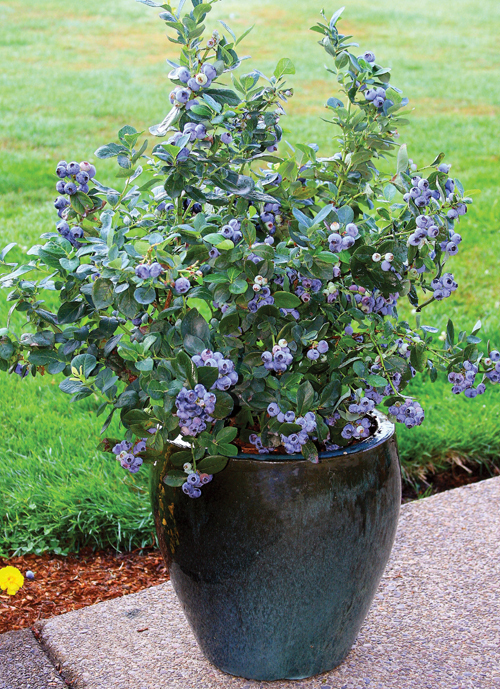 Potted blueberries are easy to care for. Water at least 1 inch per week but if your pot is in a windy area you may need to water more. 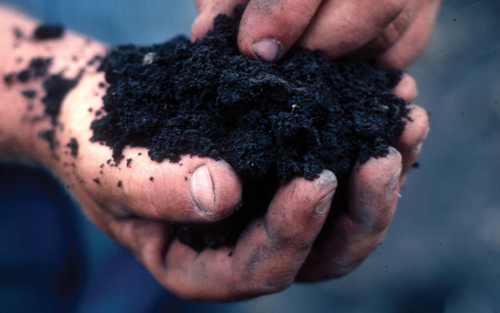 Apply a thick layer of mulch after potting to keep moisture locked in and fertilize about 3 weeks after planting. Birds can be an issue since they love to dine on the berries so you may need to net the potted plant to eliminate that issue. Don't worry about pruning for the first few years. 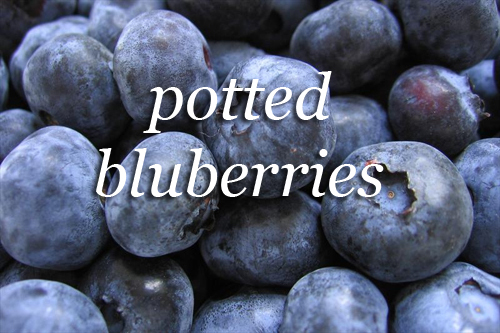 Pick the potted berries when they fall into your hand when touched. They will be very dark blue and really sweet. Refrigerate them so they don't spoil before you can eat them. Have fun & enjoy! Read more..... Make your own Japanese Garden. Read more..... Fragrant & Fruity all potted. 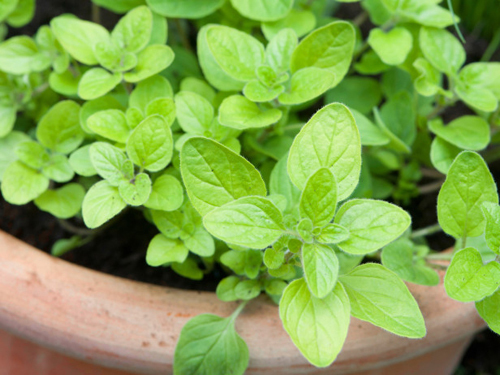 In the past, we have discussed quite a bit about growing potted herbs. Indoors or outdoors, we have provided quite a few tips and suggestions. Now we would like to narrow it down even more and give you a list of potted herbs that like shade. So read on and let us know what you think! 1. Mint - it has always been a big favorite. Well now we recommend potting it up in a shady area. It grows so fast and is so easy to tend to, that we like to use it potted up. Make sure that you don't plant directly into the soil in a shady spot or it will crawl toward the sunlight. 2. 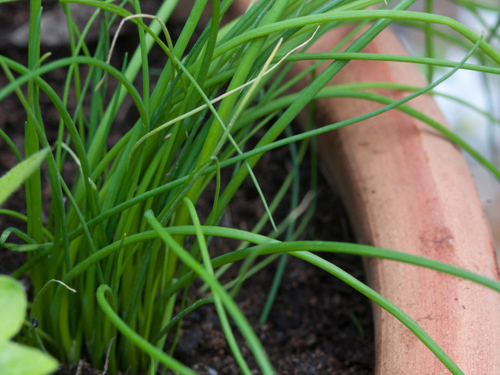 Chives - In a garden pot next to a kitchen door, this herbs does well if it's a shady spot. Small clumps like grass will sprout. All you need to do is keep them trimmed. 3. Parsley - Every ones favorite! A flat leaf parsley will grow best if the potting soil is right and keep moist. You can place the pot in partial shade with much success. 4. Cilantro - This is a favorite in the Southwest, where it is used a lot with Mexican foods. If you want to pot it up, just place the pot in the shade. Cilantro doesn't like direct sunlight. 5. 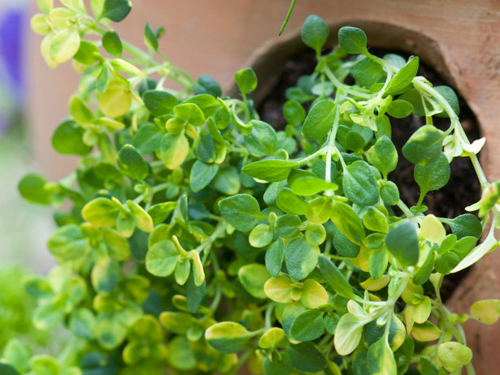 Golden Oregano - Most varieties need full sun but the leaves of the Golden oregano can fry in direct sunlight. 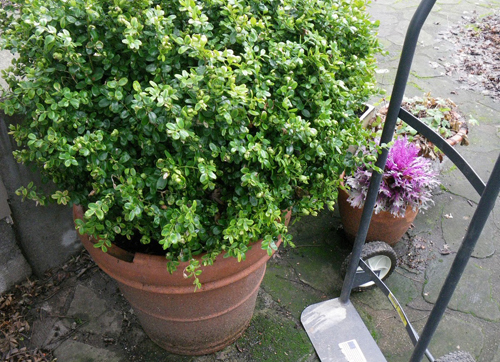 Place the pot in a partial shady spot with much success. 6. Thyme. Most varieties will tolerate shade but we recommend you let the soil dry out between watering. Use this herb in other containers where you desire a pleasant fragrance. Read more..... de-stress your life with gardening. Growing hens and chicks is super easy and fun to do. Here are a few tips to consider when trying your hand at this garden project! Most potted hens and chick love full on sun. Part time sun is fine but don't place a potted planter in the shade. Get them out there and show them off. Always provide good drainage. If you select a planter without drain holes, then they should be drilled. Don't over water these babies and don't underwater in the full on heat of summer. You can buy starters at most garden centers but we can guarantee that you will never have to buy them again. They are easy to divide and they will reproduce like mad. It's alright to leave them outside during winter but moving them indoors is not a bad idea either, especially in case of extreme cold spells. Be aware of the type of planter that you use that in case of cold the pot won't break. Potted Hens and Chicks are so much fun to play with. There are a number of varieties to choose from and any container will truly come alive with them spilling out the sides. 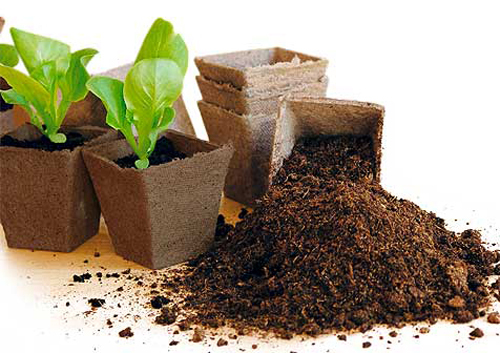 Here are a few great tips to take into consideration when setting us your container garden. In no particular order they are all helpful and easy to implement. Plants: Pick plants that are going to look good through out the season. This is not the time to plant something that will die in 3 weeks and then need to be removed. Be concerned about the type of climate the potted plants will receive. Don't put shade tolerant in a sunny location and potted plants that need full sun in a shady spot. 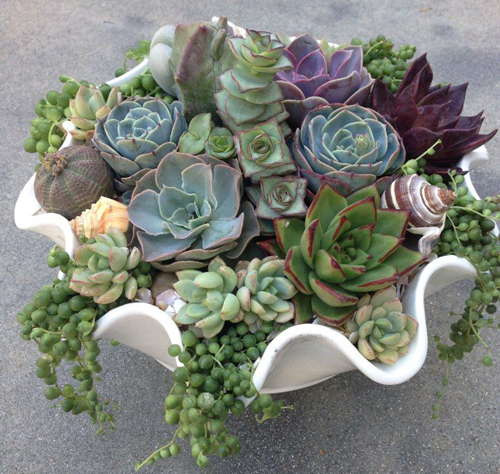 Pottery: Pick planters that compliment your home or patio area. 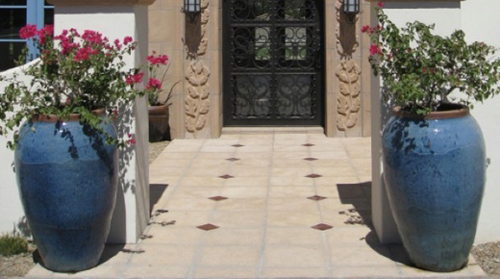 If you home is brick and traditional don't put metal contemporary planters out front. It's not that it will look that bad just kind of off a bit. Make sure they have drain holes so that whatever you plant will have good drainage for the roots and they won't sit in standing water. Watering & nutrients: The main thing all containers need is added water. Since the plants are not placed directly into the ground the pots need you make sure you keep the soil moist. If you are going to travel try using our water Ollas. 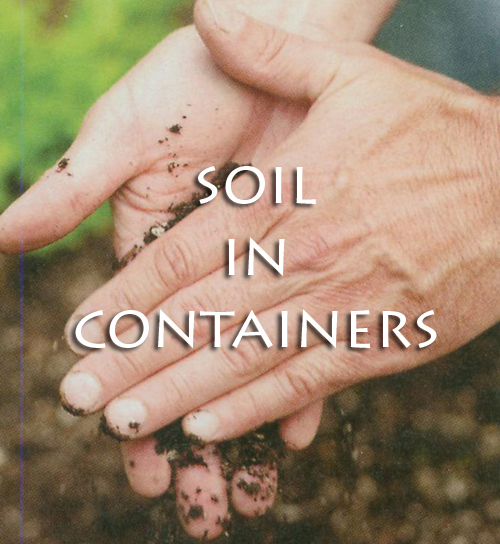 Big containers are easier because the soil will stay moist longer. If your area is windy the soil will dry out faster. Be sure and use a fertilizer since the roots can't reach the ground soil. This makes sure that your potted containers look lovely all season long. Have fun and play with your garden pottery! 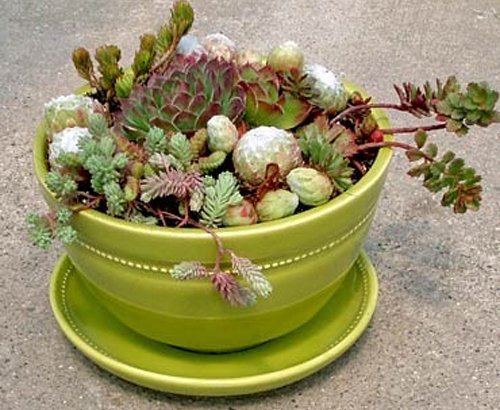 New Pot Tricks For Outdoor Planters. Below are a few tricks to help out with planting into containers. It's really easy and fun to do! +If you live where it gets cold, watch the weather for late freezes. If the weather changes abruptly, just move your potted plants into the garage where they will be protected for the night. 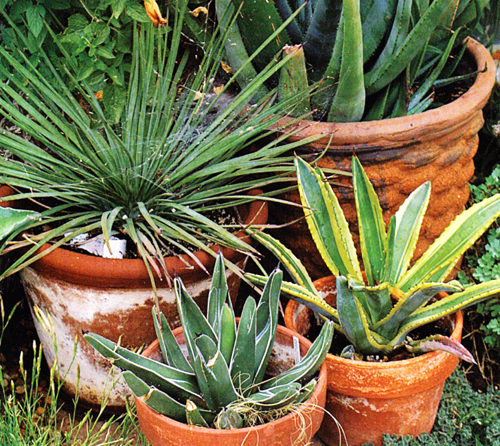 It sounds like a lot of work but it's a easy thing to do to save your plants. + try choosing a color scheme that matches flowers already planted around your home. It looks so much better when everything looks like it has a reason to be there. + make sure you choose the correct size of planters. 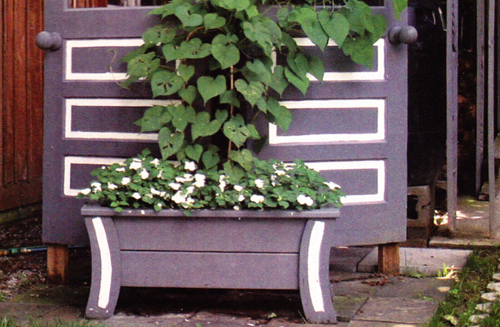 It's so disappointing to choose a planter off our website and then find out it's dwarfed sitting on your porch. 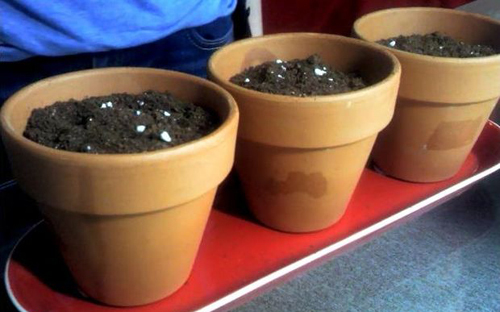 Get out a tape measure, use an empty cardboard box, anything that can help you see what size the planter needs to be. + try something different. 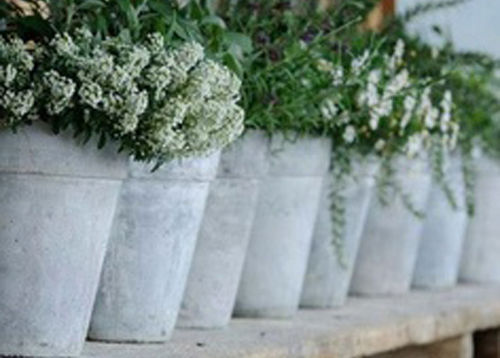 Don't just stick with standard terracotta flower pots. 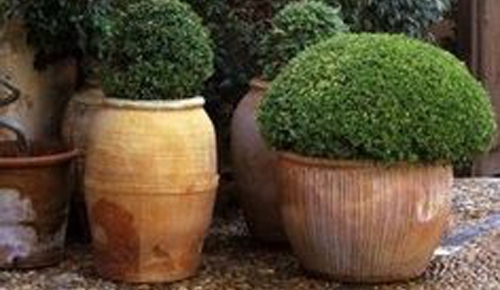 Try pots with unusual shapes and sizes, colors and finishes. + make sure you water when needed and make sure to keep the soil moist if necessary. Most flowers have short root systems so it's not always an issue with plants that have longer root systems make sure the water penetrates. Read more.....drought tolerant potted annuals. Read more.....egg shells in your spring pottery.